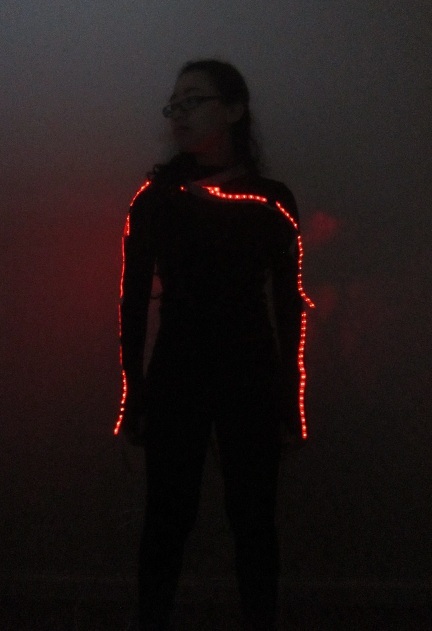 My final project was to sew a shirt that had RGB LEDs on the sleeves whose flashing modulation could be controlled by three buttons in the palms. Since the final presentations on Wednesday I’ve finally mastered the pin mapping, and now each button corresponds to a different mode of flashing on your arm. When the project was announced I knew I wanted to make something wearable with RGB LEDs. I started out thinking about making an armored gauntlet that glowed, but the idea soon grew into an entire shirt covered with LEDs. I bought a Lilypad Arduino from Sparkfun to control the LEDs, but realized too late that it did not have enough I/O pins to control all of them. Looking back I could have tried out individually addressable LEDs, but I think the ones I used look nicer. 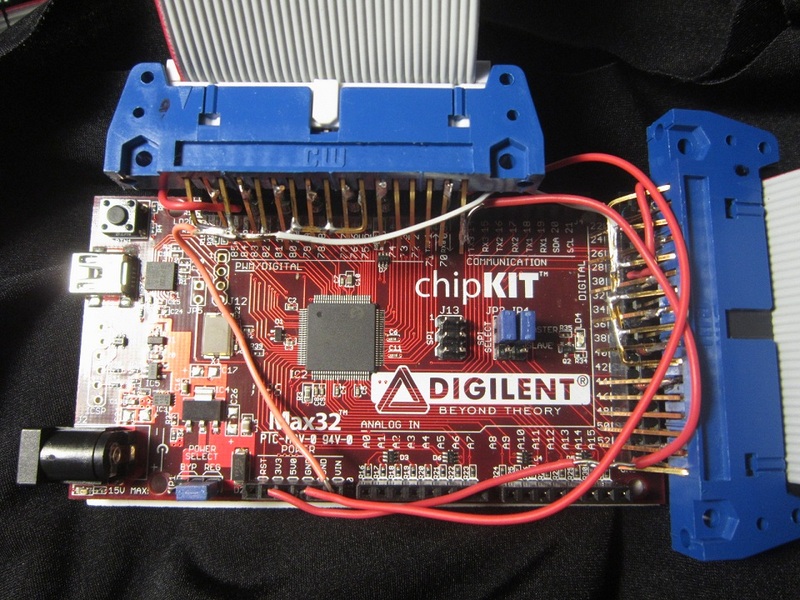 It requires a different programming environment than Arduino, but it works in exactly the same way. Much like how Arduino is similar to Processing. 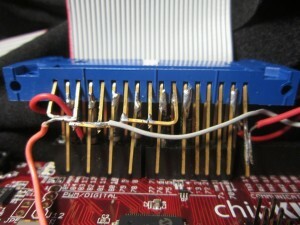 Each LED segment is soldered on to a piece of ribbon cable, which was easily attached to a 2×17 pin connector that could easily be plugged in and taken out from the ChipKit. 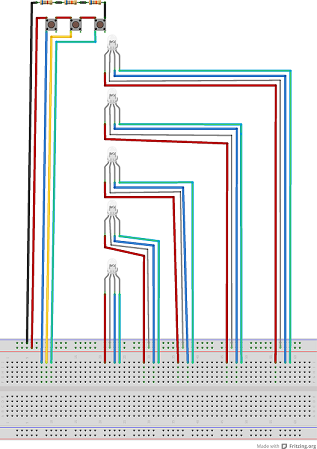 Five of the ribbon cable wires needed to be dedicated to the button panels on the palms of the sleeves; 1 power, 1 ground, and 3 signal. The actual button panels were salvaged/cannibalized from a dead Sony VCR and came already-soldered with the correct resistors. 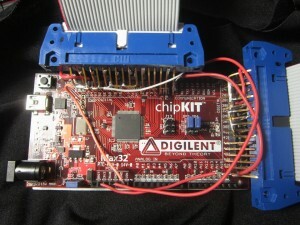 And an actual picture of the connectors to the ChipKit. 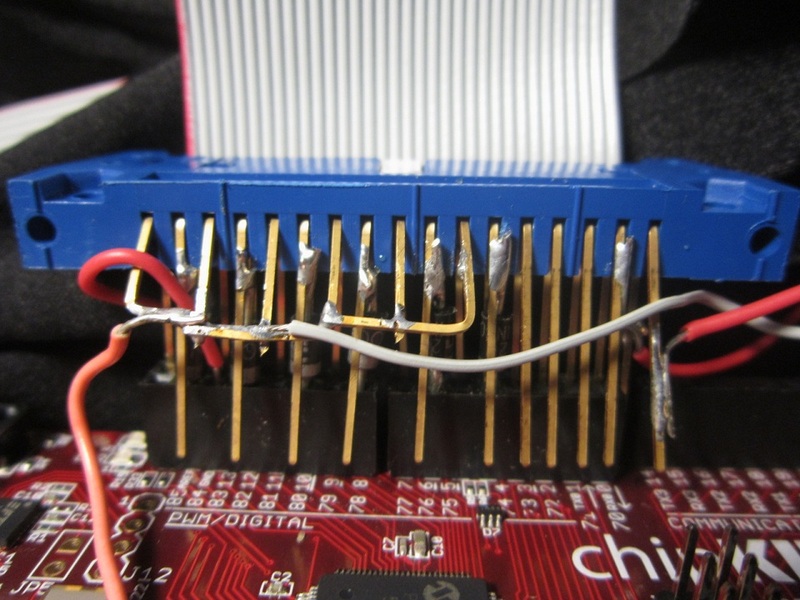 The (barely visible) diodes are for providing the correct voltage drop when the LEDs are plugged in but unlit. 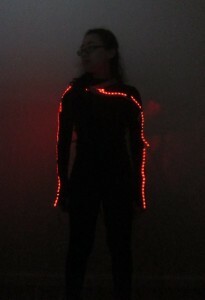 Sewing the shirt out of spandex only took me a few minutes, but attaching the LEDs to the sleeves took way longer. The stiff wires would stretch the fabric in ways that made it difficult to sew, and the adhesive on the back on the LED strips was no help whatsoever. In order to keep the pins on the bottom of the ChipKit from poking me in the back, and to make the garment (theoretically) washable I attached velcro to the bottom of the control board and stuck it to a panel of craft foam I sewed on to the back of the shirt. Altogether, I’m really happy with how this project turned out. 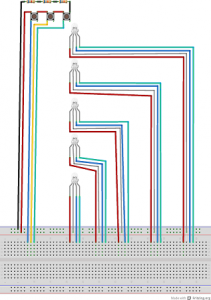 I learned a lot about pull-down resistors, pin mapping, and the wonders of ribbon cable. I also figured out how to sew a shirt out of spandex and learned a new soldering technique from my dad. The design of the electronics was well executed but I wish there was a better way of attaching the LEDs to the shirt because they stick out at awkward angles sometimes. I’m also really pleased with the way the light travels up and down the sleeves when the buttons are pressed. It would have been cool to use PWM to fade them, but there are only five PWM pins on the board. Not to mention that it would involve heavy alteration of my existing design to incorporate them. I’ve been talking with a friend of mine about possibly getting a pair of these shirts exhibited in a rave runway fashion show he is planning. He’s very enthusiastic about featuring them and it’s an exciting idea, but if I were to do that I would have to think about streamlining the integration of the electronics into the fabric and deal with the issue of battery life. Currently this piece eats a 9V battery every 10 minutes or so when it’s not plugged in to the wall. In the future I’d love to make more of these with higher durability and more light control options for performances and dancing.